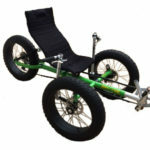 Trident: One of the most requested items our customers ask for is for a Trike that will hold a larger weight capacity than our standard 275lb weight limit. We spoke with many dealers and customers and asked them for a “wishlist” of items they would like to see on such a Trike. Higher Adjustable Seat & “Helper Bars”to make it easier to get in and out of. A 400LB rider weight capacity. Don’t break the bank- something in between the price of the 2 main choices- Rover & Magnum. With the Titan, we have successfully achieved everything on the wishlist. First and foremost was to insure that the Titan could handle the weight capacity- here’s how we did it. 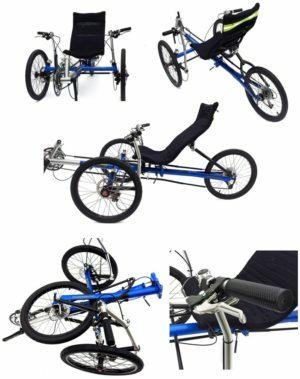 The Frame has thicker tubing, the wheels and spokes are heavier duty, the seat frame as well as the rear seat attachment are now Steel instead of Aluminum as on our other models. The biggest issue by far though was the hinge. There are 2 competing issues with hinges- if you put the hinge on the top it is much easier to fold. If you put the hinge at the bottom it is much much stronger, but it makes it incredibly awkward to fold because you have to lift the hinge up from the center instead of just folding the rear wheel over the top. At Trident Trikes we always think outside of the box , so we thought- Why not BOTH?! And while we are at it- let’s make the wheel fold flat! E Titan is a modified 9 Speed Titan- It uses an integrated system by a Japanese company called Dapu. 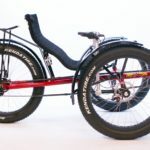 It features a 350W Geared Hub Motor, a special Cranket with sensors, a 36V 13 AH Rack Mounted Battery with built in light, and a Digital Display. With this system you can choose between throttle only or 6 different levels of pedal assist.The 36v 13AH battery is much larger than other manufacturers use and will give you a much longer range- about 30 miles electric only and up to 75 miles using pedal assist. This entire package only adds 18.5 Lbs to a Titan! Our Titan Standard Accessory Kit includes a full set of 3 fenders (For Big Apple Tires ) and a sturdy rear rack.